There are important changes to some of the Health Science Courses currently offered by offered by Australasian College of Natural Therapies (ACNT) and Southern School of Natural Therapies (SSNT) in Melbourne, Sydney, Brisbane and our online campus, that exist under the qualification provider THINK Education. Check out the COURSE UPDATES box below. Some courses include a compulsory 2, 3 or 4 day on-campus residential workshop run over a weekend. All workshops run from 9am - 5pm. 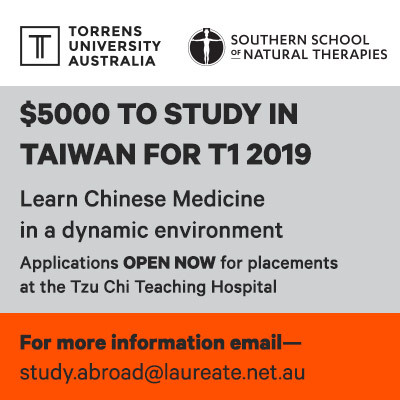 Torrens University Australia (TUA), which is also part of the Laureate International Universities network here in Australia, will soon launch four new Health Science courses. These will also be delivered at our colleges ACNT (Sydney and Brisbane) and SSNT (Melbourne) with Torrens University Australia as the provider. This will mean that the four THINK courses will be going into teach out so we won’t be taking any further enrolments into these courses. However please be assured that there are no changes to your current enrolment. Your current course will continue to be delivered until the final course completion date which will be the end of trimester 1, 2021 for Diploma students and the end of trimester 3, 2021 for Bachelor students. If you are studying part-time, and worry that you won’t be finished your studies by the final teach out periods, please don’t be concerned. We have a number of pathway options available for you to ensure you can successfully complete your qualification and we will be in contact with you to explain these options. Email study.abroad@laureate.net.au for more info.